Review Summary: On the whole DOUBLE DHAMAAL is a seriously hilarious movie that lives up to its title -- it's double dhamaal all the way. The gang of Dhamaal -- Adi (Arshad Warsi) Manav (Jaaved Jafri) Boman (Ashish Chowdhury) Roy (Riteish Deshmukh) are back. The packed theatre on an early Friday morning is pleasantly surprising. 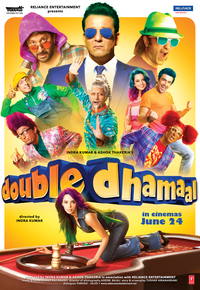 On the whole DOUBLE DHAMAAL is a seriously hilarious movie that lives up to its title -- it's double dhamaal all the way. Yes, you laugh at some instances but when you’re expected to turn off your brain and relax to a nice guffaw fest film, you know you’re heading the wrong way if your brain switches on again. Double Dhamaal is double trouble. Not half as good as Dhamaal. Director Indra Kumar, who started off with films like 'Dil', 'Beta', 'Raja' and 'Ishq', had incorporated dramatic elements in them. However he changed path with 'Dhamaal' though still he couldn't resist the temptation of adding some drama in the climax of that film as well, something that hadn't been accepted whole heartedly. However with 'Double Dhamaal' he steers clear from even a single serious moment and just ensures that the film truly stays true to it's name. Hilarious and whacking funny!! Watch it without thinking! !